In Pine Forge (near Pottstown), Pennsylvania, Sam Whitehouse, partial owner of Whitehouse Landscaping, decided to put Holganix to the test. Sam and his team set up 6 test pots with soil and seed to compare Holganix’s results on seed germination with other starter fertilizer products. What he saw was amazing! Out of the six testing pots, Holganix clearly showed the best results (as a note, the first pot contains green seed accelerator, which may alter the appearance of its results). The first test pot represents the results of a starter granular fertilizer (10-16-6) with ATH seed and Seed Alive. The results were fairly good, although the Seed Alive alters the appearance, making it seem as if the results are better than in reality. 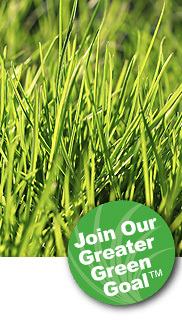 The second pot represents starter granular fertilizer (18-24-6) with Green Blade seeds. As you can see, very little seed germination occurred. In the third pot, the Whitehouse team tested Tall Fescue seed with starter fertilizer (18-24-5). The results were as dismal as the previous pot’s results. The fourth pot was the clear winner among the bunch. Here, Whitehouse Landscaping tested Holganix with ATH seed. Seed germination was clearly faster with the help of Holganix. After speaking with Sam a week after this picture was taken, he reports that Holganix continues to show better results than the other test pots. In the fifth pot, we have our runner up for the germination prize. Starter granular fertilizer (10-16-6) was used to help the ATH seeds germinate. In the last pot, the Whitehouse team tested ATH seed yet again except this time with a granular starter fertilizer at 18-24-5. Why did the seeds germinate faster with Holganix? There are many things that Holganix does for the turf, especially when it comes to seed germination. Some of the things that contribute to such great results are the fact that Holganix contains nitrogen-fixing bacteria, natural wetting agents, mycorrhizae, fulvic and humic acids as well as Chitin-degrading bacteria. The nitrogen-fixing bacteria found in Holganix feed and increase the likelihood of germination. Other ingredients such as mycorrhizae and fulvic and amino acids stimulate deeper, thicker root development, helping the turf establish itself faster. The natural wetting agents in Holganix further assist seedlings in making better use of available water. Simultaneously, Holganix helps the surroundings soil retain moisture, which in turn supports drought resistance. Chitin-degrading bacteria and other naturally occurring bacteria such as Streptomyces and Trichoderma protect the seedlings from disease through thicker cell wall development. Furthermore, Holganix replaces the vital organisms missing from most topsoils, giving the new seed a better chance of survival. Check out our website for more client testimonials and rave reviews. If you are interested in learning more about what Holganix can do for your lawns, feel free to give us a call with any questions you may have at 866-56-EARTH. 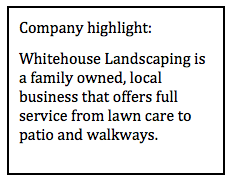 Also be sure to check out Whitehouse Landscaping at www.whitehouselandscaping.com.